We are back from our Disney World trip with lots of memories to record. I will be working on Disney scrapbooking for quite a few days weeks months to come I think! But here on my blog I am celebrating my love for My Favorite Things Stamps. And I am celebrating all month long. So each day in February I'll be posting a creation made with products from my absolute favorite company - MFT Stamps. 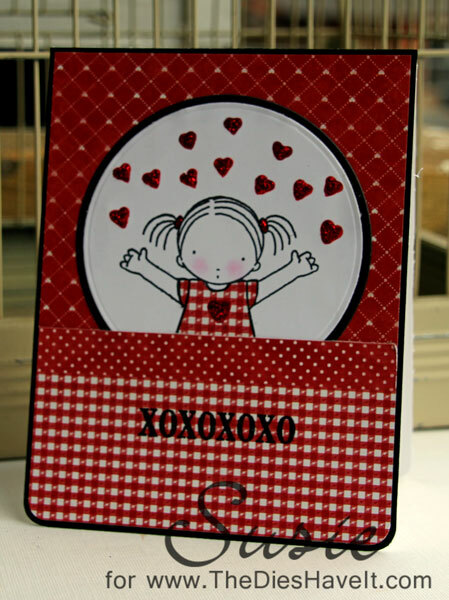 Today I am showcasing one of their new stamp sets, Love is In the Air. Isn't she just irresistible? My sentiment is from another new set, MPD Distressed Hearts. I love how their sets work so well together! The papers I used are from Authentique, The Smitten Collection. I'll be using them some more during the month as we get ready for Valentine's Day. Please be sure to come back tomorrow for Day #2 of my MFT love fest.